As part of the nationwide protest by workers of different Government schemes, the Accredited Social Health Activists (ASHA) workers, Anganwadi workers and Mid-day meal workers staged a protest demonstration here on Wednesday. As part of the protest, a rally was started from the office of the Dharmanagar unit of Centre of Indian Trade Unions (CITU) and the protesters walked across several streets of the town. 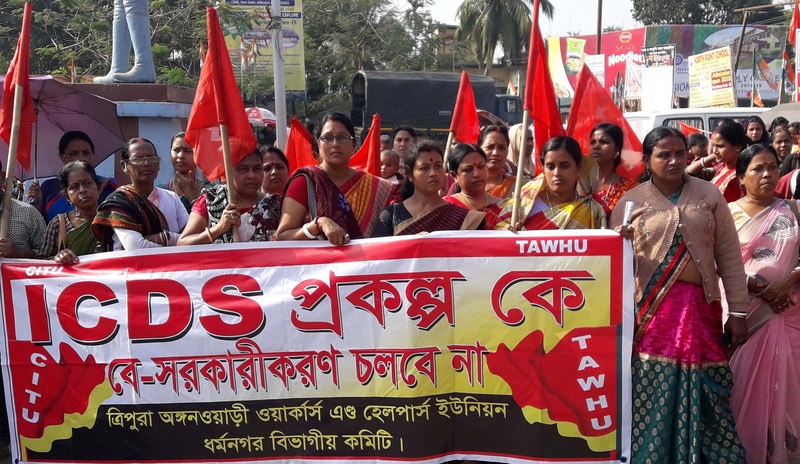 It may be mentioned that like other parts of the country, the ASHA workers, Anganwadi workers and Mid-day meal workers of the State also carried out protest rally across Tripura in support of their 4-point charter of demands. The scheme workers have demanded that they be given recognition by the government, their services be regularised under the respective schemes, their remunerations be hiked up to Rs 18000, an amount of Rs 3000 should be announced as pension along with gratuity, besides EPF and ESI facilities be provided to them. Though the Mid-day meal workers supported the move but could not remain present as they had to cook for the children in schools. It may be mentioned that Anganwadi centres are rural child care centres set up by the government in 1975 as part of the Integrated Child Development Services Scheme. Apart from the CITU, Indian National Trade Union Congress (INTUC), Hind Mazdoor Sabha (HMS), the All India United Trade Union Centre (AIUTU), Labour Progressive Federation (LPF), Trade Union Coordination Centre (TUCC), Self-Employed Women’s Association (SEWA), All India Central Council of Trade Unions (AICCTU), United Trade Union Congress (UTUC), have also reportedly supported the strike.